Quick and dirty: Some of you know that since I arrived in Chicago, I’ve made a couple of visits to my dear friend Elissa Froman’s room at Northwestern University Hospital. Today her friends launched a fundraising campaign to help her family cover expenses. If you can spare anything, please consider making a donation: http://www.gofundme.com/1bfzsw. I met Elissa when we were assigned side-by-side cubicles during our internships at Planned Parenthood years ago. A lot of people know Elissa as a civil rights champion, social justice advocate, and progressive rabbi-to-be. But she’s also just one of those people – the kind you want to sit with for hours over bento boxes at Teaism. The kind who takes on the not-so-glamorous volunteer gig setting up spreadsheets for the tiny, deserving art nonprofit down the street. The kind you want by your side at a huge political convention because not only will she rise early and go to bed late talking to total strangers and gathering petition signatures for your cause, but she’ll also insist that everyone take a break and visit the bizarre restaurant-amusement park that was featured on her favorite episode of South Park. Oh wait. There aren’t just “those people.” Elissa is Elissa. She is one of a kind. Can you please help her by helping her family? Elissa has been courageously dealing with the medical implications of the Hodkins Lymphoma diagnosis she received in 2006. Most recently, she’s been in the hospital since February 2012 related to complications from treatment. For eight months she has shown strength, patience, and valor to a degree that seems impossible. She’s done a lot of work, but now it’s our turn. Let’s cover rent and medical bills for her and the Froman family as best we can. Elissa has always found power and comfort in Friedrich Nietzsche’s words, “He who has a why to live can bear almost any how.” She is our why. p.s. I spotted the GoFundMe link on my friend Emily‘s Facebook page less than an hour ago. I have already donated and have since refreshed the page several times; the total is already above $2,000. I believe this is a testament to Elissa’s incredible knack for community-building and making others feel loved. I hope you’ll show her family some love today if you can. 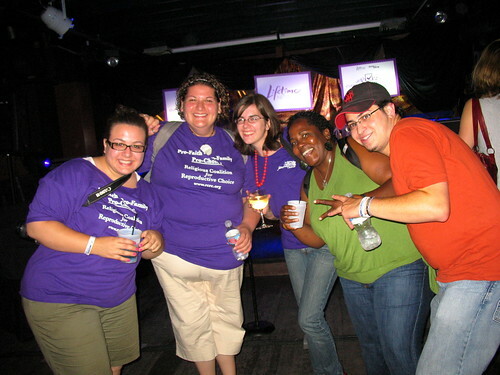 Photo: Me (middle) with Elissa (second from left) and other pals at the DNC in 2008. This entry was posted in Community, People and tagged bone marrow transplant, friends, fundraising, lymphoma. Bookmark the permalink.